One of the most successful rock acts of the 1970s, 1980s, and 1990s, Genesis enjoyed a longevity exceeded only by the likes of the Rolling Stones and the Kinks, and matched in progressive rock circles only by Yes (who, in fairness, have had their periods of inactivity). In the process, they provided a launching pad for the superstardom of members Peter Gabriel and Phil Collins, and viable star-level careers for members Tony Banks, Michael Rutherford, and Steve Hackett, each in his own right. The group had its roots in the Garden Wall, a band founded by 15-year-olds Peter Gabriel and Tony Banks in 1965 at Charterhouse School in Godalming, Surrey, where fellow students Michael Rutherford and Anthony Phillips were members of another group called Anon. The two groups initially merged out of expediency as the older members of each graduated; Gabriel, Banks, Rutherford, Phillips, and drummer Chris Stewart soon joined together as the New Anon, and recorded a six-song demo featuring songs primarily written by Rutherford and Phillips. The Charterhouse connection worked in their favor when alumnus, recording artist, and producer Jonathan King heard the tape and arranged for the group to continue working in the studio, developing their sound. It was also King who renamed the band Genesis. In December of 1967 the group had its first formal recording sessions. Their debut single, “The Silent Sun” — a very deliberate Bee Gees-style pastiche — was released in February of 1968 without attracting much notice from the public. A second single, “A Winter’s Tale,” followed just about the time that Chris Stewart quit — his replacement, John Silver, joined just in time to participate in the group’s first LP sessions that summer. At this time, their music was a form of lyrical folk-based progressive pop, built on lush melodies primarily carried on acoustic guitar and piano, with lyrics that tended toward the florid and trippy, in keeping with the tastes of the time — psychedelia was in vogue, and Genesis (who signed their collective name to the writing credits of their early songs) showed an exceptional facility with poetic content as well as gorgeous melodies. To the uninitiated, those early sides sounded a lot like the work of the Bee Gees, the Beatles, or the Moody Blues of the same era — though with more of a freewheeling approach to tempos and arrangements than the latter. King later added orchestral accompaniment to the band’s tracks, in order to make them sound even more like the Moody Blues, and the resulting album, entitled From Genesis to Revelation, was released in March of 1969. That title, incidentally, was the only indication of the group’s name — as it turned out, there was an American group of the same name working at the time, and in order to skirt the issue of a name change, King merely incorporated their name into the LP title. In any event, it passed without too much notice from the music press and even less from the public — the general perception at the time was that their music was neither fish nor fowl, too pop-oriented in its melodies, spirit, and approach to fit in with the heavy psychedelia of the period; but also too complex to appeal to those listeners enamored of the Bee Gees and other pop/rock acts; and not nearly hard-rocking enough to appeal to the fans of the likes of Cream, Jimi Hendrix, et al. With an album and three singles behind them and little to show for it except the music, Genesis seemed to be shaping up as a brief digression in the lives of the members — their contracts with King and with Decca Records ended in June of 1969, and as neither manager nor label, nor the members seemed interested in pursuing any more work with each other, everyone went their separate ways. Phillips and Gabriel were about to graduate from Charterhouse, and planning to attend college, while Rutherford was already at Farnborough Technical College and Banks was studying physics, no less, at Essex University. Despite these plans, the group members felt strongly enough about their work, that they decided to try it as a professional band; it was around this time that Silver exited, replaced by John Mayhew. They got their first paying gig in September of 1969, and spent the next several months working out new material. Genesis soon became one of the first groups signed to the fledgling Charisma label, founded by Tony Stratton-Smith, and they recorded their second album, Trespass, that spring. Released in October of 1970, this record showed the first signs of the band that Genesis would become — it was still more folk-based than most progressive rock of the period, and some of the songs couldn’t quite carry their length; and they had some way to go in terms of vocal and instrumental finesse. But it had reach if not grasp — most of the album was comprised of extended pieces, sung with dramatic, almost operatic intensity and highly involved arrangements and complex parts for all of the instruments. One number in particular, an extended conceptual piece called “The Knife,” stood out, and an excerpt from it was issued as a single. Neither that record nor the LP charted at the time, but Trespass was a necessary first step in laying the foundation of the group’s sound. The album also marked the end of the first phase of the group’s history, as Genesis lost two members soon after its completion. The band wasn’t entirely happy with Mayhew’s playing and he left, to be replaced by Phil Collins, a former child actor turned drummer and an ex-member of Hickory and Flaming Youth. More unsettling was the departure of guitarist Anthony Phillips, who had developed crippling stage fright and was advised that the best solution was to give up performing in public. His decision to leave reportedly left Rutherford and Banks in doubt about the group’s future, and replacing him wasn’t easy — indeed, for some time afterward, Genesis worked as a four-piece with the guitar parts on their songs covered by Banks’ keyboards. Finally, just prior to the band’s beginning work on their next album, their lineup was completed with the addition of guitarist Steve Hackett, a former member of Quiet World. Their next album, Nursery Cryme, was started so close to his arrival that, as later revealed, Hackett hardly played on it at all — most of the guitar parts were written and played by Michael Rutherford. And, indeed, though no fans were aware of it at the time, the centerpiece of the new album, “The Musical Box,” had its origin during Phillips’ tenure with the group and used material that Phillips had composed, presumably salvaged by Rutherford. Regardless of its origins, there was hardly a weak moment on the record, and the music was far more exciting than most of the progressive rock of the period. Moreover, it had a daring edge — the heart of the record was “The Musical Box,” a song telling a Victorian-era story of children, murder, and ghostly apparitions. And while it might not have become a pop culture phenomenon, the album and the song did find an audience among collegiate listeners, principally from the more cerebral members of the public who were lofting Emerson, Lake & Palmer’s and Yes’ albums high up the charts. Nursery Cryme didn’t chart at the time, though it did reach number 39 in England three years later, as a wave of newer fans belatedly discovered the album — it did sell well enough and get good enough reviews, however, to keep the band going in this new lineup. Additionally, as part of the new lineup, a new lead voice was added to their sound on one song, courtesy of Phil Collins. The theatrical attributes of Gabriel’s singing fit in well with the group’s live performances during this period as he began to make ever more extensive use of masks, makeup, and props in concert, telling the framing stories in order to set up their increasingly complicated songs. When presented amid the group’s very strong playing, this aspect of Gabriel’s work turned Genesis’ performances into multimedia events, with “The Musical Box” one of the highlights. And word soon began to spread about Genesis being an act that was worth hearing and, even more so, worth seeing in concert. Foxtrot, issued in the fall of 1972, was the flash point in Genesis’ history, and not just on commercial terms. The writing, especially on “Supper’s Ready” — another conceptual piece, this time taking up an entire side of the LP — was as sophisticated as anything in progressive rock, and the lyrics were complex, serious, and clever, a far cry from the usual overblown words attached to most prog rock. One important reason for their popularity was that as ambitious as the group’s music ever got, it was never boring, or even less-than-bracing. Genesis albums were best heard in their entirety but no one seemed to mind the time or attention they demanded, even on repeated listenings — the album also became their first to chart in England, reaching number 12. Genesis’ live performances by now were practically legend, and in response to the demand, in August of 1973 Charisma released Genesis Live, an album assembled from shows in Leicester and Manchester originally taped for an American radio broadcast. Songs such as “The Knife,” “The Musical Box,” and “Watcher of the Skies” (a song initially conceived by Banks and derived from renowned science fiction author Arthur C. Clarke’s writing) were presented in their most recent and dramatic incarnations. The sole flaw in that album was that it was only a single LP, without room for the performance of “Supper’s Ready” that had been recorded at those same shows. The group’s next release, Selling England by the Pound (1973), featured Gabriel’s strongest vocal performance and transcendent work by the rest of the band, especially Tony Banks’ keyboards, which took on a light yet fiercely lyrical profile. It was also their biggest seller to date, reaching number three in England and number 70 in America. They were still a cult band in the United States — the single “I Know What I Like (In Your Wardrobe)” had scarcely registered in the United States — but thanks to a lot more FM radio play their music was getting heard beyond the ranks of the cultists, and finding new listeners, by the thousands if not the millions, especially on college campuses. The release in late 1974 of the ambitious double LP The Lamb Lies Down on Broadway also marked the culmination of the group’s early history. A concept album with a very involved story and a large cast of characters, its composition had been difficult, involving a story outlined and written (along with most of the lyrics) exclusively by Gabriel. The singer had worked separately from the rest of the group for most of the composition, and a creative split developed between him and the others, which was exacerbated by personal problems that Gabriel was going through at the time, involving his marriage. The division grew worse during the tour that followed, when the other members began to feel that his performance — and the costumes and costume changes that he required — began to seriously detract from the music. In May of 1975, Gabriel announced that he was leaving Genesis. This could have marked the end of the group, and for many longtime fans that’s precisely what his exit represented. Yet The Lamb Lies Down on Broadway had been a breakthrough as well, played heavily on progressive FM stations and selling in far greater numbers than anyone expected of a double LP by this group — it just missed the Top 40 in the United States by one chart number, while in England it got to number ten. Their concert attendance had grown substantially as well. The group tried auditioning potential replacements, but it became clear that the remaining members all preferred that Phil Collins — who had provided some vocals on a very limited basis on the group’s three prior albums — take over the role of lead singer. The band returned to the studio as an official quartet in October of 1975 to begin work on their new album: the resulting Trick of the Tail was not a huge departure from their earlier work — there were still musically challenging progressive songs on the album, but they were reined in a bit compared with the last three albums, and there was some effort to make the album and the music as accessible as possible. And it worked, the album reaching number three in England and number 31 in America, the best chart showing up to that time for a Genesis album. Its success completely confounded critics and fans who’d been unable to conceive of Genesis without Peter Gabriel. The group seemed to be on its way to bigger success than it ever had during Gabriel’s tenure, with 1977′s Wind & Wuthering. Like its predecessor, the album fit into a progressive rock mode, but even the extended pieces such as “One for the Vine” had a lighter texture and tone to much of its length and was typical of most art rock of the time, and Wind & Wuthering also contained a genuinely appealing pop song, “Your Own Special Way,” which reached number 43 in England and number 62 in America; its true success, however, may have been in selling the album, which got to number three in the U.K. and number 26 — another high for the group — in the United States. It looked as though they had ridden out the crisis of Gabriel’s exit, and, in fact, were soon playing their biggest international tour to date. And then Hackett announced that he, too, was leaving. His decision became public on the eve of the release of a new double live album, Seconds Out, recorded along that successful tour. This time there was a permanent alteration in the group’s way of making music — he was replaced on subsequent concert tours by Daryl Stuermer, but there was no permanent replacement in the studio; instead, Rutherford, who had subbed for Phillips on the latter’s exit in 1970, played all of the guitar parts on their subsequent recordings in addition to his bass work. In 1978, Genesis released the appropriately titled And Then There Were Three, which abandoned any efforts at progressive rock in favor of a softer pop sound. Up to this point, Genesis’ recording success in the U.S. had been focused entirely on their albums — though they’d been releasing singles steadily since 1968, none had ever been successful on the American side of the Atlantic. That all changed with “Follow You, Follow Me,” their first AM radio chart hit in the United States, which helped And Then There Were Three earn the group’s first RIAA-certified gold record award. The subsequent tour was their biggest yet, and kept them busy for much of the second half of 1978. They were inactive for most of 1979, having been working steadily for close to a decade, and when they returned to work on the album Duke (1980), it was with a very different musical agenda — gone were all of the progressive rock elements that had been present in their music since 1970, and in their place was a slickly commercial pop/rock sound. The public responded in kind by lofting it to the number one spot in England, a first for the band, while it reached number 11 in America. They followed it up with Abacab (1981), a totally unexpected, stripped-down pop/rock album that even had the three core members interacting musically with the Earth, Wind & Fire horn section. Like its predecessor, it topped the charts in England and easily made the Top Ten in the United States. It was followed by another concert album, Three Sides Live — which, rather confusingly, appeared in two different versions, with three live LP sides and a handful of singles on the fourth for the United States, while in Europe the fourth side was filled out with concert recordings from prior tours. During this period, a flurry of solo projects involving current and former members of the band began flooding the marketplace — Gabriel had been doing them, with great success, across the late ’70s, soon joined by Phillips and Hackett; Banks had started writing soundtrack music in 1978, and he and Rutherford took the time off in 1979 to do solo projects, while Collins’ first solo album, Face Value, emerged in 1981, after a couple of years’ gestation. By mid-decade, he was singing (and acting) full-time, separate from the group, while Rutherford, as the leader of Mike + the Mechanics (fronted by Paul Carrack), was enjoying pop success. In 1981, the band regrouped for the self-titled Genesis, which furthered the group’s record of British chart-toppers and American Top Ten hits, becoming their second million-selling U.S. album while also yielding their first American Top Ten single, “That’s All,” while “Mama” was another hit off the same album. Two years later, the group outdid themselves with the release of their most commercially successful album to date, Invisible Touch, which — driven by a quintet of Top Ten U.S. singles, including a number one chart placement for the title song — went platinum several times over in America. Its release coincided with the biggest tour in their history, a string of sold-out arena shows that cast the group in the same league as concert stalwarts like the Rolling Stones and the Grateful Dead. It was seven years before the band released their next album, We Can’t Dance — their first CD original, as it happened, the digital format having swept over the music marketplace in the interim — which debuted at number one in England and got to number four in America. During that time off, each of the member had done extensive solo work, and Collins had already become a superstar in his own right. We Can’t Dance was Collins’ last album with the group, and with him the group also lost Chester Thompson and Daryl Stuermer, longtime members of the live version of the band. Their new vocalist was Ray Wilson, formerly of the group Stiltskin, while the drumming was shared by Nir Zidkayhu and Nick d’Virgilio. The reconstituted Genesis resurfaced in 1997 with Calling All Stations, which recalled their art rock roots in some respects. Neither the critics nor the fans warmed to the album — it sold relatively poorly, missing the Top 50 in the United States, and the single “Congo” only got to number 29 in England. The accompanying tour was equally unsuccessful, and many dates were canceled. 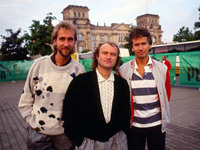 Wilson left the group at the conclusion of the tour, and Banks and Rutherford put Genesis on hiatus as a working or recording band. In the wake of that disappointment, the long-awaited box set retrospective Genesis Archives, Vol. 1: 1967-1975 was even more welcome. Containing nothing but unreleased material and rarities, the four-disc set was released to surprisingly strong reviews in the summer of 1998. A second volume, containing unreleased material from the Phil Collins era, Genesis Archives, Vol. 2: 1976-1992, followed in 2000. Both sets were put together with the participation and advice of the bandmembers, present and former, and between their release, Banks, Rutherford, Hackett, Collins, and Gabriel regrouped for a one-off re-recording of “The Carpet Crawlers” for inclusion of the hits compilation Turn It on Again: The Hits. The late ’90s also saw the first wave of upgraded CD reissues of the group’s work. The Genesis CDs originally released on Atlantic Records in America were very disappointing in sound quality, and even the U.K. CDs from Virgin Records — which had acquired the Charisma label — were uneven in quality, though better than their U.S. counterparts. The new round of remasterings solved that problem and their success showed that the group still had a huge following in all of its different incarnations.